Alyssa Milano is Joined by Husband Dave Bugliari & Son Milo at UNICEF Snowflake Ball! Alyssa Milano is joined by the most handsome dates at the 2018 UNICEF Snowflake Ball! The 45-year-old actress looked stunning in a black gown and matching cape as she was joined by husband Dave Bugliari and their 7-year-old son Milo at the event on Tuesday night (November 27) at Cipriani Wall Street in New York City. 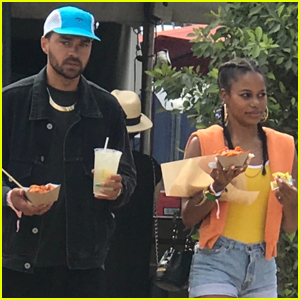 Other stars at the event included Sheryl Crow, celebrity chef Sandra Lee, along with Ringo Starr and wife Barbara Bach. Kyle MacLachlan also attended the event alongside his wife Desiree Gruber and their 10-year-old son Callum. Inside the event, Alyssa took to Instagram to share a cute photo while cuddling up to Milo. “Milo was my date to #UnicefSnowflake Ball. I can’t think of a better way to spend an evening. Children helping children. #StartsWithU,” Alyssa captioned the below photo. FYI: Alyssa is wearing a Pamella Roland dress and APM Monaco jewelry while carrying a Tyler Ellis clutch. Demi Moore Receives Woman of the Year Award at Peggy Albrecht Friendly House Awards! Demi Moore is the Peggy Albrecht Friendly House‘s top Woman of the Year! The 55-year-old actress stepped out looking chic in a burgundy pantsuit as she arrived at the luncheon hosted by the the charity home on Saturday afternoon (October 27) at the Beverly Hilton Hotel in Beverly Hills, Calif.
Other stars at the event included host Amber Valletta along with rocker Ringo Starr and his wife Barbara Bach. The charity is the first residential program in the country for women recovering from alcohol and drug abuse. 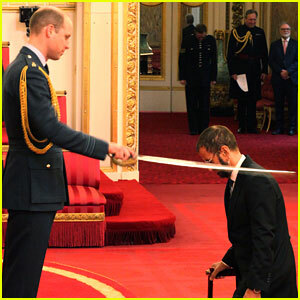 Ringo Starr kneels down and gets knighted by Prince William during an Investiture ceremony held at Buckingham Palace on Tuesday (March 20) in London, England. William stood in for his grandmother Queen Elizabeth, who was previously expected to be present at the ceremony. Ringo joked about his new title of “Sir” after the ceremony. Ringo was joined at the event by his wife Barbara Bach and they posed for photos outside the palace after the ceremony. 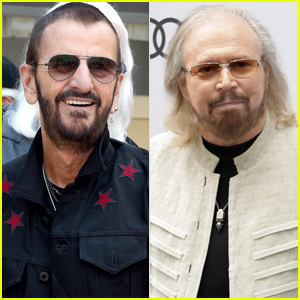 Ringo Starr and Barry Gibb are set to receive one of the highest honors from Queen Elizabeth! The 77-year-old Beatle and 71-year-old Bee Gees member will receive knighthood as a part of the queen’s annual New Year’s Honours. Ringo, who was knighted with the Beatles back in 1965, will be knighted as a Member of the Most Excellent Order of the British Empire for his contributions to music. “It’s great! It’s an honour and a pleasure to be considered and acknowledged for my music and my charity work, both of which I love. Peace and love,” Ringo told BBC. Meanwhile, Barry, who was knighted as a Commander of the Order of the British Empire with the Bee Gees in 2004, will receive the Knights Bachelor for his services to Music and charity. Madonna strikes a pose while arriving at the premiere of The Beatles: Eight Days A Week – The Touring Years held at Odeon Leicester Square on Thursday (September 15) in London, England. 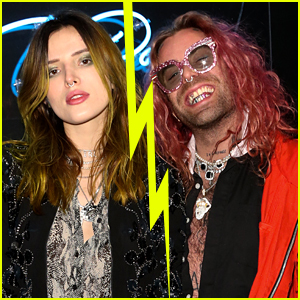 The 58-year-old entertainer was joined by Beatles members Paul McCartney and Ringo Starr, as well as Paul‘s designer daughter Stella McCartney. According to People, Madonna flew to London because she was “concerned” after her ex Guy Ritchie allegedly left their son Rocco, 16, alone during his first week back to school. Also pictured below: Madonna touching down at Heathrow Airport earlier in the week before meeting up with Rocco‘s school principal. FYI: Madonna is wearing Porsche Design sunglasses. 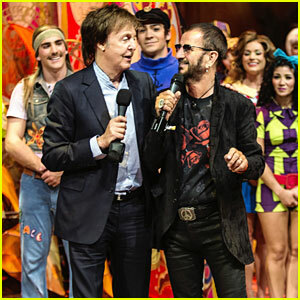 Paul McCartney and Ringo Starr reunite on stage during the 10th anniversary Celebration of ‘The Beatles LOVE by Cirque du Soleil’ held at The Mirage Hotel & Casino on Thursday night (July 14). The two original Beatles members were joined by their wives, Nancy Shevell and Barbara Bach, plus Yoko Ono, Olivia Harrison, and Joe Walsh. The anniversary performance introduced vibrant new acts — including advanced projection technology, new acrobatic acts, a remixed soundtrack with a new song, “Twist and Shout”.